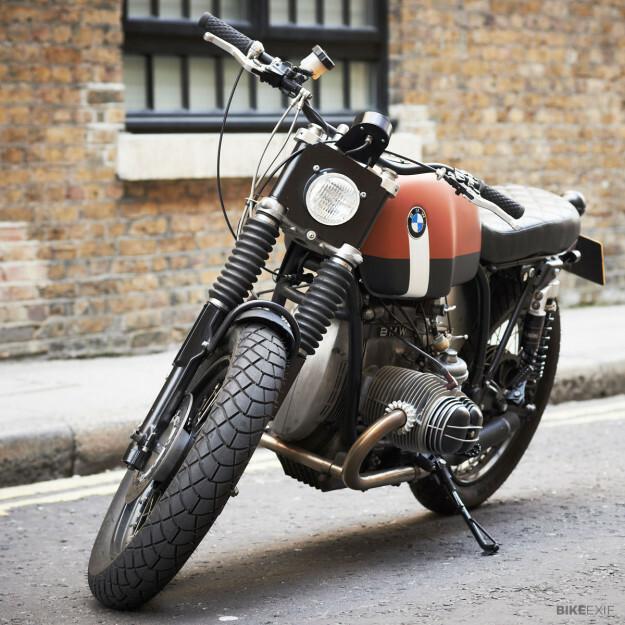 New wave customs are occasionally criticized for their lack of performance when compared to modern machines costing the same money. The answer, obviously, is that outright performance is not the be-all and end-all when it comes to riding. For many people, character counts for more, however you define it. UMC began by stripping the RS of its fairing and all other unnecessary parts to shed weight. The sub frame was shortened and the pannier rack altered to accommodate a new rear loop—which was welded in by Jakob, under the supervision of UMC co-founder Rex. The rear shocks were upgraded with adjustable Wilbers items, and new rims with stainless steel spokes were fitted with Michelin M45 dual sport tires. The frame and forks were powder coated satin black, with the valve cover fins polished rather than painted. Rex overhauled the engine with new valves, valve guides, rings, and big end shells. The heads, barrels and cases were given a thorough vapor blasting, the gearbox was stripped, and new bearings installed. Nuts and bolts were replaced with stainless steel throughout. Again, Jakob was involved. “Tapping into Rex’s technical know-how, Anita’s wiring skills, and Adam’s ideas was fantastic. I learned a lot,” he says. 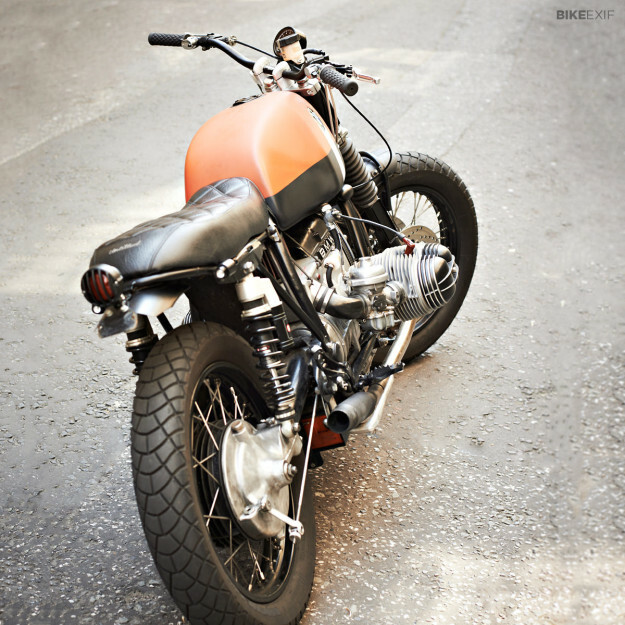 The bike was completely rewired with a Motogadget speedo installed behind a custom headlight unit. A small Odyssey battery was relocated under the engine, hidden inside a hinged box designed by UMC’s San Francisco workshop. 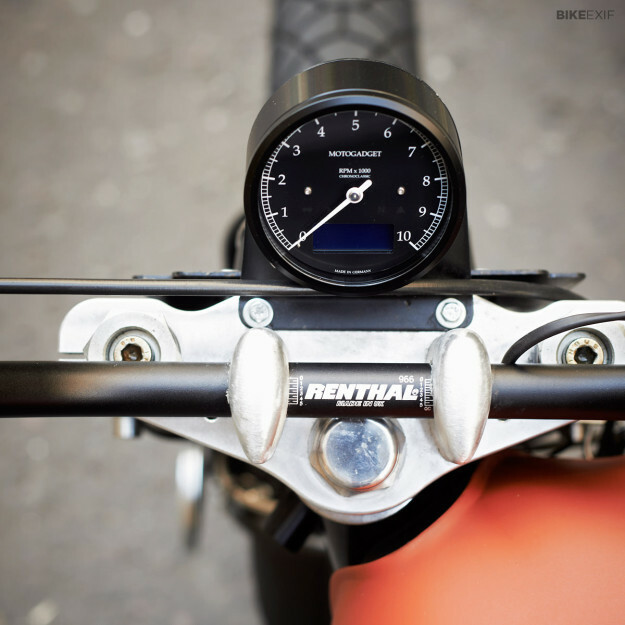 Renthal bars sport Untitled Motorcycles’ signature minimal switchgear and hidden wiring; they also hold a Yamaha R6 master cylinder and aftermarket levers. 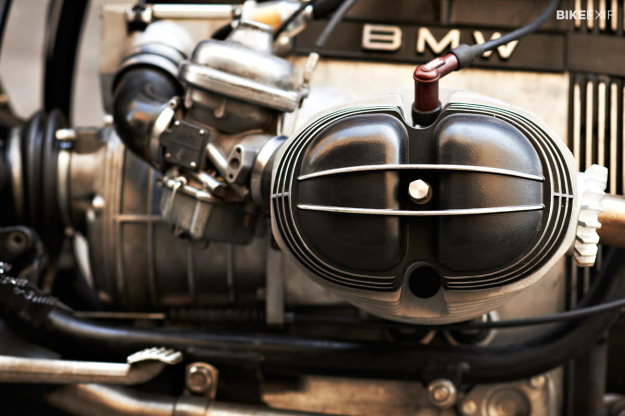 These operate reconditioned Brembos and allow modern two-finger braking. 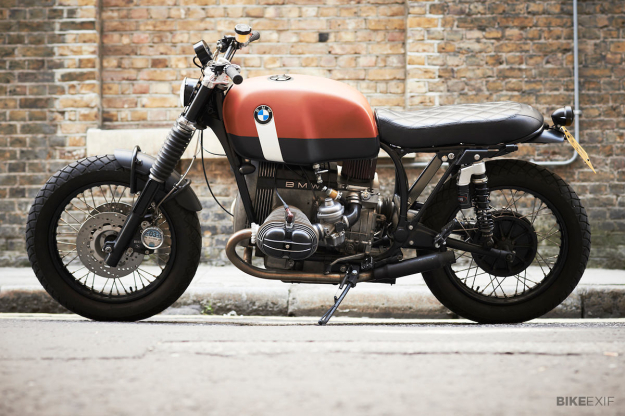 The matt orange, black and white colour scheme was created by Jakob’s furniture designer brother and applied by UMC’s paint specialist, D-Lucks, who also reconditioned the original BMW badges. A diamond-stitched leather seat crafted by Glenn Moger, another UMC staple, complements the crosshatched grips. Images courtesy of Damian McFadden. Check out our coverage of previous Untitled builds here, or follow Adam & Co. via their website and Facebook page.